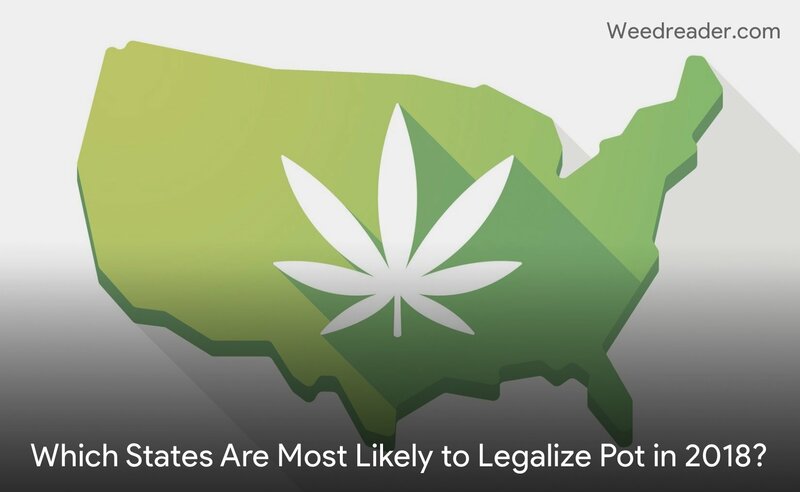 Home » Analysis/Opinion » Which States Are Most Likely to Legalize Pot in 2018? Which States Are Most Likely to Legalize Pot in 2018? The election is still a ways off, but one state has legalized pot already in 2018. Vermont made history back in January by becoming the first state to ever pass a recreational cannabis law through the legislature – as opposed to putting it up for a popular vote. And there are almost a dozen states that are slated to have cannabis legislation on the ballot in November. Democrat Phil Murphy was elected governor of New Jersey running on a very progressive platform, which includes support of marijuana legalization. He promised to sign a recreational use bill into law – if the Democrat led legislature can send one to his desk. There are currently two proposed bills: one would legalize recreational use for adults 21 and over; the other would decriminalize possession of up to 10 grams of cannabis. But polling shows that New Jersey voters are pretty evenly split, with 49 percent in favor of legalized pot, and 44 opposed. So there is no guarantee that either of the proposed bills has enough support to make it to the governors desk. In Michigan, the Coalition to Regulate Marijuana Like Alcohol has been hard at work to get a legalization measure on the 2018 ballot. They needed 252,523 signatures on their petition, and they collected and submitted more than 360,000 signatures. Now they’re waiting on the Secretary of State’s office to verify the signatures. If confirmed, then the Michigan Marijuana Legalization Initiative will be up for a popular vote on November 6th. And with recent polls showing 61 percent in favor of legalization, there’s a strong chance that the measure could pass. Earlier this month, an appropriations committee in Connecticut voted to approve house bill 5394, a recreational marijuana bill. The bill calls for state officials to develop a plan for the legalization and regulation of cannabis, as well as expanding substance abuse treatment, education and prevention. The plan is due to be completed by October 1st, at which point it would have to be voted on by the General Assembly, where it still faces some strong opposition. New Hampshire, Rhode Island and Delaware have all formed committees to evaluate the impact of recreational marijuana markets in their respective states. They are facing the reality of their neighbors – Maine, Massachusetts and Vermont – passing recreational cannabis legislation. The committees are to put forth recommendations for the state legislature, but whether we see any bills up for a vote this year is still up in the air. Ohio is still working on a recreational marijuana measure, but the deadline to get it on this year’s ballot is rapidly approaching and nothing has been submitted so far. They need to submit the measure and petition more than 305,000 valid signatures by July 4th in order to vote on it in November. And their failed bid in 2015 shows that organizers in Ohio are struggling to bring the interested parties together on this issue. Finally, Oklahoma and Utah both have medical marijuana initiatives on the ballot this year. And a number of other states have bills being considered that would legalize medical marijuana, including Wisconsin, Kentucky, Missouri and South Carolina. Hi Amy 🙂 North Carolina does have an active legalization movement — NCNORML and others — with lots of marches and other demonstrations. They have even legalized CBD treatments for specific patients with severe seizures. However, nothing I’ve read indicates that they are anywhere near legalizing recreational use, or even passing broader medical use laws. I don’t live there, and don’t have first-hand info, so I could be wrong. (I hope I am!) But I wouldn’t bet on any new cannabis laws being passed in NC this year.